RS-99 Refractory Sheet | ZIRCAR Refractory Composites, Inc. Type RS-99M is a plastic highly moldable sheet ideally suited for forming custom geometries. Type RS-99W boards can be moistened with water and molded into any desired shape. After low temperature bake-out of 300°C (570°F) boards are unaffected by moisture. Type RS-99R boards are prefired and are unaffected by moisture. They stay rigid even if saturated with water. * Maximum use temperature is dependent on variables such as stresses, both thermal and mechanical, and the chemical environment that the material experiences. ** Properties expressed parallel to thickness. ^Properties expressed perpendicular to thickness. Refractory Sheet Type RS-99M and RS-99R are high density fiber based ceramic with greater than 99% alumina purity. 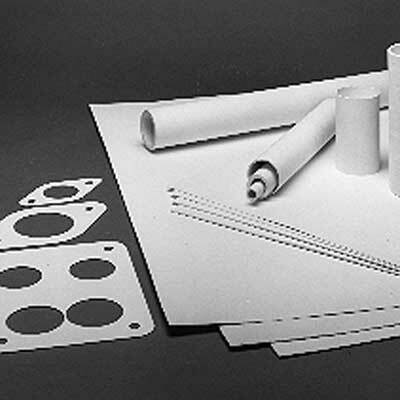 They are reinforced with a high purity alumina paper and are ideal to temperatures up to 1650°C (3002°F). Type RS-99M boards can be moistened with water and molded into any desired shape. Type RS-99W boards are unaffected by moisture after a low temperature bake out of 300°C (570°F). Type RS-99R boards are prefired and unaffected by moisture and remain rigid even if saturated with water. Type RS-99 is the ideal TransiteTM and asbestos-cement board replacement. Type RS-99 is used as a high and low temperature electrical insulator. Type RS-99 is used for brazing separators and fixtures. The high Al2O3 content makes it resistant to sticking in many environments including molten metals. Type RS-99 is used in the glass industry as dead plates, set out plates, wear guides and pusher pads in hot glass handling. Type RS-99 is used as induction furnace components such as channel melter components, coil liners, coreless induction components, covers, tops, bases, front and back plates, coil supports, splash and coil shield. Type RS-99 is used for rapid cycle furnace door cowls and hot face supports. Type RS-99 is used as a high and low temperature gasketing. Type RS-99 is use as non-ferrous metal handling as pouring spouts, troughs, and casting tips. Custom sizes are available on request. Boards can be made as small as .5″ x .5″ x 1/32″ and as large as 24″ x 48″ x 1″. Cylinders can be made as small as .5″ inside diameter, .56″ outside diameter and .5″ length and as large as 30″ inside diameter, 32″ outside diameter and 72 ” length. Our manufacturing process and machining capabilities allow a wide variety of shapes to be made. Please contact us with your special requirements.